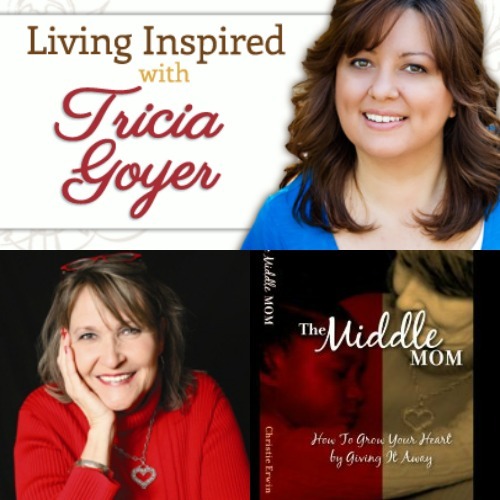 This week on Living Inspired, please welcome Christie Erwin, author of The Middle Mom: How to Grow Your Heart by Giving it Away…a foster mom’s journey. If you’re reading this after 6/5/14 you’ll be able to find this show . . . and all my shows in the archive section. For your chance to win a copy of The Middle Mom sign up below. Winners will be announced here on Wednesday. Christie Erwin has cared for over forty children in the past fifteen years, in both the public and private sector. She is one of the founders of Project Zero, which strives to raise awareness about adoption in Arkansas. She is also the coordinator of the Pulaski County Heart Gallery as well as a founding member of The C.A.L.L. (Children of Arkansas Loved for a Lifetime). Christie and her husband, Jeff, live in Little Rock, Arkansas with their five children. Every foster parent knows how hard, yet rewarding, it can be to care for a child with a difficult past and an uncertain future. Christie Erwin has been a mom, in the middle, for countless children over nearly two decades. In this poignant and insightful book, she honestly shares the reality of making yourself vulnerable to the pain and indescribable delight of giving your heart away to a child. If you have ever considered foster parenting and just aren’t sure you have what it takes, let Christie’s inspiring, faith-filled story assure you that there is One that can and will equip you with all you need.